Most of the basic components used here are commonly available from Electronics stores such as Maplin Electronics and Farnell. 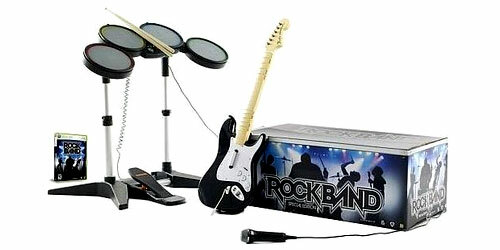 The ROCK BAND "Instrument Edition" can readily be found in stores as well as Amazon and eBay. Cordless drill with 7.5 mm drill bit; Knife or wire strippers; small screwdriver set; Needle nose pliers; Small hot glue gun and or cable tidies (optional). 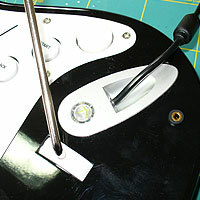 Flip the guitar over and remove the 12 screws around the edge of the rear black cover. Next remove the four long screws that secure the neck of the fret board. Remove the backing to expose the circuitry within. A bit messy isn't it? Don't worry though, it's not as complicated as it looks for what we're going to do next. Fit the switch socket (A). Splice the two wires leading from the switch socket into the two wires of one of the strum bar reed switches (C) such as can be seen at point (B). Carefully find a spot for your 3.5mm socket to fit. 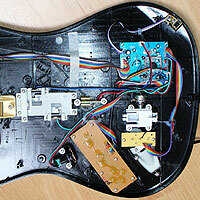 Make sure you'll be coming through black plastic alone well clear of any of the guitar's controls. 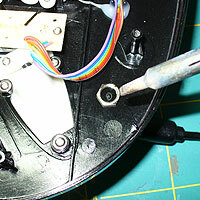 Make a pilot groove by melting a small spot where you intend to drill with your soldering iron. Drill the hole for your socket (7.5 mm drill bit with the socket I'm going to use here). 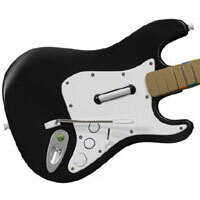 Flip the guitar over and carefully tidy up the hole on the other side. Take two lengths of wire, long enough to comfortably span the route from point A to point B (see large image above). 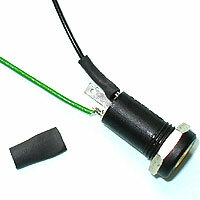 Solder these to short tags of your socket as pictured. Heat-shrink these if you wish to add strength and to insulate. Remove the nut. Push the socket through the front of the casing. Fasten in place with the metal nut. To secure this further you may wish to hot-glue the nut into position. 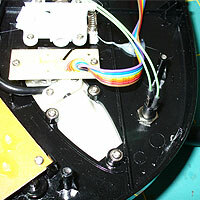 Thread the two wires from the socket up to point B, ensuring that they will not snag on any of the guitar's moving parts. Use cable tidies to secure. Splice each wire of the socket into one of the two wires leading from one of the strum bar's reed switches. Use insulating tape or shrink-wrap to insulate any bare wires. 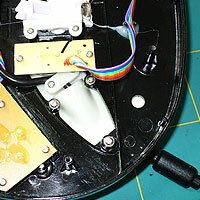 Reassemble the casing then connect an accessibility switch (or the foot pedal from the drums). Now for the fun bit: "testing". I prefer testing on a PC for convenience. 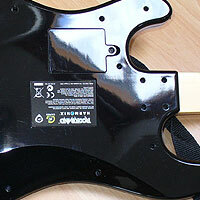 The PS3 guitar is recognised as a USB game controller as soon as you connect it. The Xbox 360 version may need a driver to be installed. 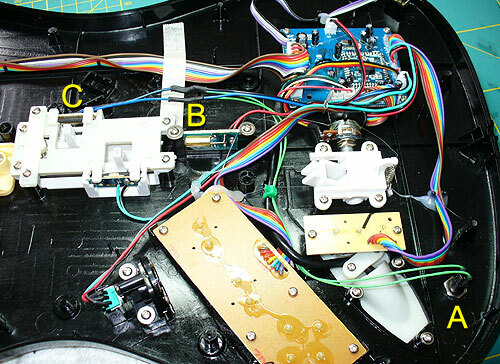 Once your guitar is connected correctly, you should be able to see if all is working via the Joystick Properties utility accessed via the Control Panel. Your connected switch should be recognised as the "Point of View (POV) Hat" either UP or DOWN. If your switch does not seem to be working, and you know it does, unscrew the case again and retrace your steps. Connect two switches for faster strumming by connecting a 3.5mm two into one stereo adapter. Add extra sockets for each fret button. Time consuming but straight forward. 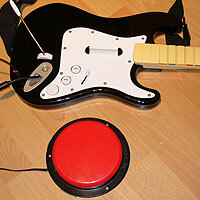 Use JoyToKey to use the guitar and plug in switch as a keyboard or mouse controller. 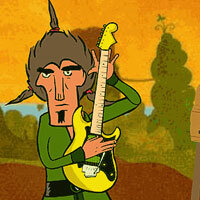 Play frenzied guitar licks as Mr. Fast Finger. Stomp moles in Whack-a-Monty Mole and play other one-switch games.